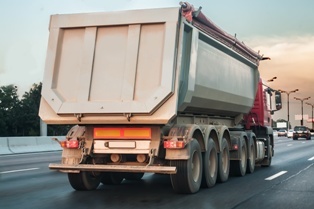 A collision with a semi-truck can cause devastating injuries, no matter how the accident occurs. However, drivers and passengers are at considerable risk when their vehicle strikes the back of a tractor-trailer. Trucks have bigger wheels and larger frames, placing the back of the trailer much higher than the bumper of a passenger vehicle. As a result, the entire front end of a car can slide under the trailer, shearing off the roof and proving deadly for the occupants in a rear-end crash. Underride accidents can happen on all sides of a trailer, and are overwhelmingly likely to be fatal for the occupants in passenger vehicles. For this reason, commercial trucks are required to have barriers (known as rear-impact or underride guards) installed on the back of their trailers. Unfortunately, these accidents continue to occur—and in most cases, the commercial trucking carrier could have done more to prevent them. Inadequate markings. Proper underride guards should be marked with reflective material so that the back of the trailer is visible at night and in inclement weather. A driver may fail to see a two-ton trailer on the road ahead simply because of peeling tape or caked-on mud. Improper guards. While all U.S. trucks are required to have rear guards, side guards are not yet mandatory for large trucks. Without side guards, smaller vehicles may become wedged under the side of a trailer during merging or due to a tired trucker’s lane departure. To make matters worse, rear guards have been shown to offer little protection to drivers who strike the trailer on the right or left rear corner rather than straight-on. Poor maintenance. Rear-end accidents commonly result from a trucker’s sudden braking, making defective brakes or malfunctioning trailer brake lights particularly deadly to following cars. Trucker error. The way a trucker drives can greatly affect the extent of damage and injuries in a crash. A trucker who is speeding, using drugs, following too closely, or distracted by electronic devices is increasing the risk of an underride accident. Want to know more about your legal rights after an accident in Illinois? Download your FREE copy of our book, When the Rules of the Road Get Broken: A Guide to Illinois Car Wreck Cases, or contact The Tapella & Eberspacher Law Firm via our online contact form to schedule an appointment.